As hard drives continue to get bigger and less expensive I've started encoding all of my music in the lossless FLAC format. 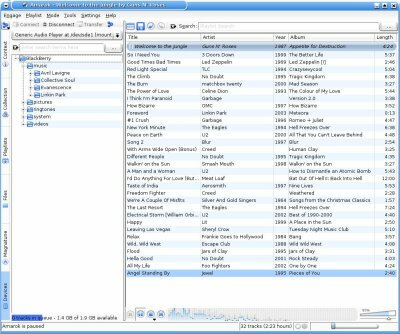 While I can listen to any format on my computer, my BlackBerry Curve has more limited space and plays MP3's. I could manually transcode songs as needed, but that adds significant complications. 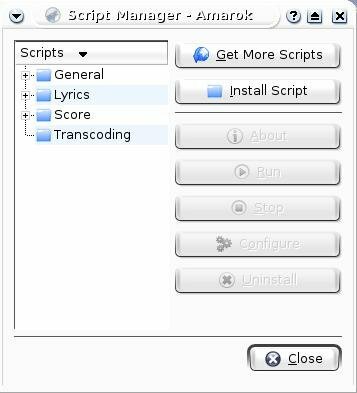 Fortunately, Amarok supports transcoding scripts to automatically convert songs to a desired format. 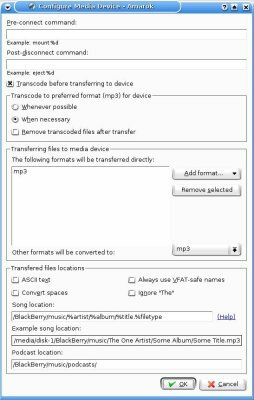 If your music collection includes file formats other than MP3 then it's a good idea to enable transcode support. 1. Start by selecting the Script Manager from the Tools menu. 2.If you already have a script under Transcoding then you can probably skip to step 4. If not, click the Get More Scripts button. 3. Pick Quick and Dirty Transcoder from the list and click Install. Hit OK once it has been successfully installed and close the window. 4. Select dirtyxcode from the Transcoding folder and click Run. 5. Close the Script Manager. gstreamer-tools and gstreamer0.10-plugins-good needed to be installed on my Kubuntu 7.04 system before a conversion would work. Quick and Dirty Transcoder defaults to 128Kb/s, but the script can be edited if you prefer a different bit rate. Tags are kept through the conversion. Select Configure Amarok from the Settings menu and click the Media Devices icon. If your BlackBerry isn't listed, hit the Autodetect Devices button. This found the expected device, but the Plugin field was empty. I picked Generic Audio Player. Next, click on the Configure device settings button. It looks like three interlocked gears. This dialog enables you to choose the formats that you want to use and the song location. If you have transcoding setup make sure the Transcode before transferring to device option is selected. 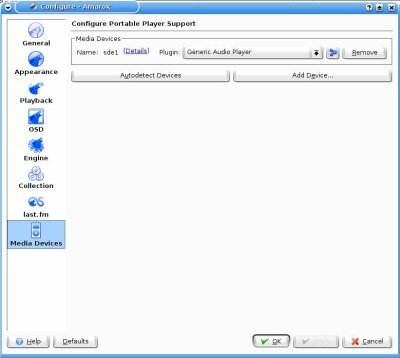 By default Amarok will convert all songs to MP3 format, although you can change this by adding new formats. Click the Devices tab at the bottom of the left sidebar and you should now see the Generic Audio Player listed. Hit Connect. The BlackBerry folder should now appear in the tree view. The first step is figuring out what music you want to transfer. 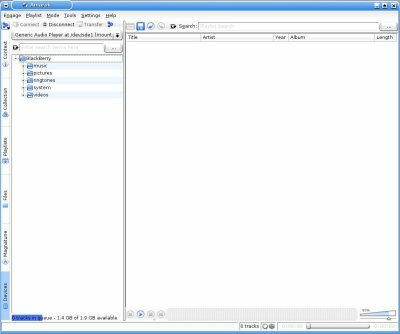 Populate the current playlist just like you would when playing back music directly on your computer, then take those files and drag them to the folder tree to the left. All of the selected songs will appear in a transfer queue. To copy them to the BlackBerry you need to click the Transfer button near the top of the screen. After the transfer completes your music should be ready to play. Happy listening.